Holidazzle is all about the people, places and products that make our local scene so special, and that includes the sensational foods, beverages, crafts and merchandise scene. Take a look at groups that will be on hand throughout Holidazzle this winter! Shop our 2018 Holidazzle vendors! We’ve got an incredible selection of local foods, beverages and merchandise at this year’s Holidazzle. Come down and experience them all throughout the holiday season. Enjoy the season’s smells and tastes with this family-owned business selling cinnamon roasted almonds, pecans and cashews. Gorkha Palace offers authentic Nepali, Indian and Tibetan cuisine. They use high quality fresh ingredients sourced from local organic and sustainable farming. From the delectable, juicy, momo of traditional Tibet to the richly flavored spiced curries of Nepal and India, their eclectic cuisine reflects the flavors of the Himalayans. Minneapolis-born, Fulton Brewing will be delighting adult Holidazzle goers with an EXCLUSIVE Holidazzle Proper Porter brewed specifically for this holiday season! The Holidazzle Proper Porter pours a beautiful black with ruby highlights. Flavors of toffee and chocolate help to balance the roasty-ness of this wonderful porter. For 2018, they�ve taken their special Holidazzle beer and spruced it up a bit for the occasion. This year, they�ve added locally made cold press coffee from Big Watt to give Proper Porter an even more nuanced taste and finish. It is a limited edition, so get it while supplies last. While you’re here you can also enjoy their select popular brews also on site. Quench your thirst with local hot cider and water available, both of which complement the delicious local tastes and savory smells accompanying you through your Holidazzle journey! Stop in at K-Town Street Food and try out their fries or a few of their signature offerings, including Kimchi Fries, a Korean taco bowl (tortilla chips topped with choice of grilled meat, kimchi, choice of sauce) and Bulgogi Beef Empanada Puff Pastry (stuffed Bulgogi Beef, potato, tomatoes, Mexican cheese and onions). All sauces are hand-made and delicious with varying degrees of spice. A must try! Since 2011, Kabomelette has served breakfast to enthusiastic (and hungry!) crowds. They offer healthy, gluten-free and convenient alternatives to customary fried-anything-on-a-stick. They combine popular omelettes with tasty steak kabobs. Don’t miss out on the special Holidazzle Hash: omelette of your choice (bacon/veggie/cheese) with Hollendazzle sauce. Try them! A staple of Minneapolis since 1954, Kramaczuk’s Sausages will bring its local tradition of producing delicious sausage from Northeast to Holidazzle, including their German Brat, Polish Sausage, all-beef hot dogs and a special Holidazzle sausage with cranberries and wild rice! Based in New Prague, Lady A’s makes cupcakes from scratch every time. Plus, at Holidazzle try their amazing raclette (melted European cheese over potatoes)! A Midwestern favorite, stay warm with a helping of local cheese curds or sweet mini donuts as you stroll through Holidazzle! Misfit Coffee was created with the idea of paving the roads of Minneapolis, Minnesota with the best cup of coffee imaginable, leaving our mark on every customer that they meet along the way. Located in the Holidazzle Shops tent, stop by and get to know this coffee trailer that cruises the Minneapolis streets. For them it�s about more than coffee, so they focus on creating a pure sensory experience for each customer, transforming all of their passion and previous learnings into a beverage that can be enjoyed in an open air, community-oriented atmosphere. I Look So Good Smoothies are designed to make your body feel good inside and out. None of the smoothies are made from concentrate or sugary juices, meaning you�ll be enjoying high-protein, low-sugar smoothies with flavors you can taste! At Holidazzle, enjoy their hot healthy salted mocha, “Ja Mocha Me Salty”, and their Oh My Gourd Mon. iPierogi offers several pierogi treats on hand at this delicious Holidazzle stop, including pierogis with meat, pierogis with potato and cheese, and crepes/blintzes filled with cream cheese. North Mallow creates all-natural, homemade marshmallows in a variety of exceptional flavors. Each Friday at Holidazzle, stop by North Mallow and get a s’mores package to roast over a Holidazzle bonfire. Their s’mores with their specialty-flavored mallows are a must-try this Holidazzle season! Have you tried a Poffertjes? You’ll want to stop and test out these tiny pancakes made just for you at The Littlest Pancake! Also, test out their soup and apple cakes which will be available as well. Straight from their home in Northeast Minneapolis, Sociable Cider Werks brings its expertise to Holidazzle to help you enjoy the festive atmosphere with sips of a Minnesota favorite. This year’s Fat Bike Mulled Apple is even more sweet when served warm and is made from freshly-squeezed apples�never concentrate! Paella, a traditional Spanish rice dish, is sure to warm you up at Holidazzle this winter. Ingredients like Spanish short grain Rice, Saffron, Smoked Pimiento, Piquillo Peppers and Extra Virgin Olive Oil are all imported from Spain to keep the flavors authentic. Try an assortment of delicious comfort food that include delicious dry-rub ribs and Gill�s famous Mac & Cheese. Hailing from Wisconsin, the Cheese Brothers will bring their many cheeses to Loring Park this winter. From gift boxes to cutting boards to blocks of cheese, there is plenty to choose from the Cheese Brothers. Candy should be fun! Freynika Chocolate is a new artisan chocolate confection company specializing in over 30 flavors of handmade truffles, crazy fun chocolate bars, kosher marshmallows and marshmallow pops, and vibrantly flavored organic caramels. Freynika Chocolate sources only Fair Trade Certified chocolate, organic cream, local butter, and Minnesota-made ingredients whenever possible to support the local maker community. 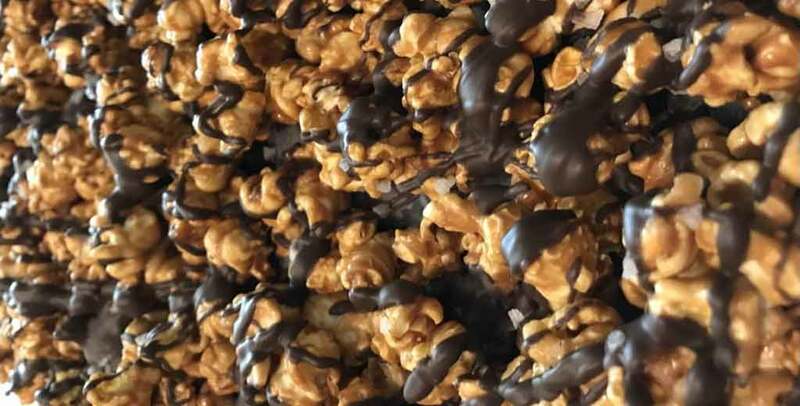 Hip Hop Gourmet Popcorn�s belief is simple: Great snacking leads to great experiences. This is why they use premium ingredients to make incredible popcorn and unbeatable flavors. Their flavors are uniquely created through love of popcorn and trends in the culinary world. The Thirsty Whale bakery is an up-and-coming custom bakery in Minneapolis. Their baking includes everything from cookies and holiday treats to lefse, and they bring their assortment of sweet treats to Holidazzle each weekend! Never fear winter again. Let the little sisters and brothers of The Abbey wrap you in the luxury of genuine Alpaca. The Abbey raise their own alpaca in Minnesota. Their fleece is seven times warmer than wool, softer than cashmere and hypoallergenic. Don�t miss their toasty warm ALPACA SOCKS, and their hand-made HATS, MITTENS, and SCARVES. Plus, come see their alpacas on the first four Sundays of Holidazzle (Nov. 25, Dec. 2, Dec. 9, Dec. 16)! For five years now, Ann Aas has been crafting unique pieces of jewelry and other accessories. Through enameling, Ann creates colorful and textured designs that are truly one-of-a-kind. Bare Naked Soap was born out of the desire to find a healthier soap alternative. Using the cold process method, their goat milk soap is hand-crafted in small batches using the highest-quality base oils, fragrance and/or essential oils, natural colorants and fresh goat milk. Based in Jordan, Block Paper Scissors offers a chance for people to enjoy hand-made art to add to your home. Shop their work at Holidazzle or even work on your own at a workshop on site. Sand it. Stain it. Build it. Paint it. Love it! Blue Egg Farmstore is a small family crafting plant infused batches of amazing goodness for your family. From their organic sugar scrubs to creamy body butters, best ever lip balms to our plant infused muscle rub oil, natural sunsprays to aromatherapy oils, everything is handmade with love right here on their funky little farm. They believe that what you put on your body is just as important as what you put in your body, so all of their plant infused products are made without harmful chemicals, synthetic fragrances or annoying dyes. Blue Turtle Handmade Crafts offers a variety of gifts and ornaments all handmade with Polymer Clay. Beautiful handmade ornaments and jewelry that look just like old-fashioned Christmas candies, colorful boxes, clay roses, Braille items and more, perfect for gift giving! Cabin Customs creates custom metal gifts, ornaments and designs. 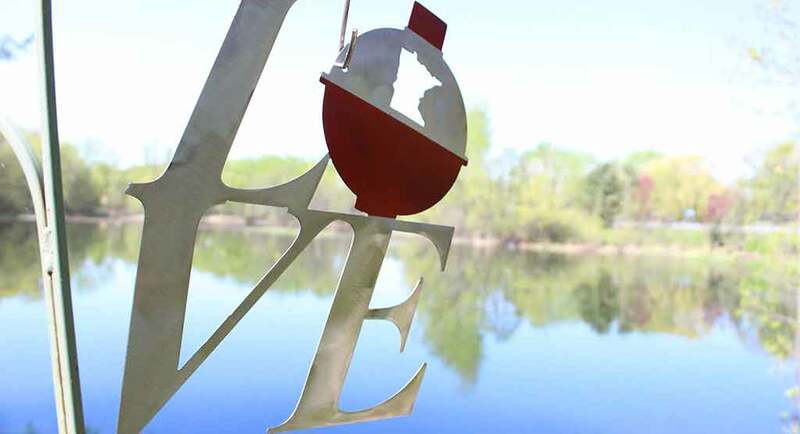 Find anything from Minnesota or America themed items, custom lakes, custom states, custom ornaments, and much more. A coaster that helps you save! Inside each kitschy tin are coaster gift cards each worth $10 off your tab at the venue featured on the coaster. Pop the tin, select a coaster and enjoy! Can�t decide where to go? Use the Dinner Spinner inside each tin�give it a spin and let the foodie fun begin! The award-winning Cooper Kit, a quarterly subscription box, provides men with an entertaining way to bond with their kids. Every three months, families get a box filled with themed projects that both dads and kids enjoy doing together. Cooper Kits are packed full with 5-9 activities, including building and creativity activities, a bed-time storybook, cookbook, and more. Each box is centered around character building with projects turning into teachable moments around a virtue or value. DK Wood Toys workshop are created in Sparta, Wisconsin. All of our toys are hand crafted by DeWayne, Deanna and our sons Don and Doug. Our wooden toys are made with quality craftsmanship. All of our toys are designed for children and adults The toys are safe and simple. We use only heat treated lumber and a non-toxic wood finish. All of the colored toys are dyed with kid’s drink mix. The toys are built to withstand years of play and then be passed onto the next generation of children. Do Me A Favor offers uniquely handcrafted sterling silver jewelry with semi-precious stones from around the world as well as hand-painted ceramic ornaments. Do Wood Son specializes in building custom chairs, tables and doors. DWS products are made with great craftsmanship and attention to detail, and they feature a variety of sports, states or symbols. Based in St. Paul, Dragonflies and Cards has a 3D pop-up card for any occasion. Duluth Coffee Company�s mission is to source, roast and craft coffee with integrity and intentionality. Coffee is their vessel for improving the lives of everyone from origin to cup. Fair Anita is a social enterprise that’s all about investing in the power of women. They sell trendy, affordable, artisan-made jewelry and accessories that provide livable wages and fair trade jobs to over 8000 women in 16+ developing countries. The Faribault Woolen Mill endures as one of the last vertical woolen mills in America. Here, fifth generation craftspeople take raw wool and create blankets, throws, scarves and accessories of remarkable comfort and quality. Leather goods, clothing, jewelry, purses and accessories for you and your home – many favorite things! Based in New Ulm and inspired by their little girl and their golden retriever, Hounds and Honeys creates blankets, bibs, crib sheets, dog bandanas, clothing and more. Each time you purchase a pair of these trendy socks from Hippy Feet, they will donate a pair of socks to someone in need. Their long-term mission is to create a program where they offer part-time employment to those experiencing homelessness in our community. K&Co Boutique’s passion is helping women feel good about themselves and beautiful in their own skin. They want to bring you comfortable, trendy and affordable clothing and accessories, and they do that through their boutique line, custom shirts and bath and body products. KCM Woodwork makes high-quality wood crafts by hand, including painted and engraved wooden signs, coffee mug holders, wine racks, baby half moon-shaped cradles, six-foot cedar light houses, light tea candle holders with bases, wall decorations, wooden centerpiece boxes with mason jars/flowers, and more. Grab your special Holidazzle Love Your Melon hat to stay warm during Holidazzle and throughout the winter! Founded in 2012, their mission is to put a hat on every child battling cancer while providing immediate support for families and helping fund research initiatives to beat childhood cancer completely. Midwest Woodcraft has a passion or wood and working with their hands. Their goal with everything they make is to discover what is hidden in the bark and highlight what took decades to produce. It’s like a food truck–only better! Stocked with a delicious assortment of art from Midwest artists, the Minnesota Art Truck delivers loads of something for everyone. On any given day, you’ll find original, one-of-a-kind jewelry, books, paintings, sculptures, weldings, weavings, robots, yard art, mixed-media, wire art, woodwork, pens, journals and more. Minny & Paul was founded with a vision to elevate gift giving and make it easier to share high-quality local goods. You pick the gift set, they handwrite your gift message and send directly to that special person in your life. They are here to help spread gratitude through local gifting. The Mpls Craft Market will be taking over the Holidazzle Market tent from Dec. 13 through Dec. 16. The space will be packed full of local artists and makers selling handmade jewelry, clothing and accessories, woodwork, home decor, prints, fiber art and more. The lineup of artists will be different each day, so visit us throughout the weekend and you’ll always find something new. Modern Cover desires to do good with design. Their unique and playful designs are inspired by the creativity and fun that children bring into the world. Modern Cover�s focus is to help kids in as many difficult situations as possible�poverty, homelessness, starvation, abuse, and others�by contributing a percentage of their sales toorganizations who can help. Find a card for friends or family with the perfect dose of sarcasm or profanity that you can�t find anywhere else. Since 2013, Muddy Mouth Cards has been offering new words to show you care for birthdays, holidays, babies, weddings, or just because. Northern Drift is a casual lifestyle brand developed by a Minnesota husband and wife team, and inspired by the nautical side of the land of 10,000 Lakes. Our goal is to provide timeless products that reflect a love of life out on the lake, and chasing summer all year long. Based in Excelsior, North Shore Apparel/Martin’s brings Minnesotans high-quality lake gear. Hats, t-shirts, sweatshirts will be on sale at Holidazzle, as well as pajamas, socks, scarves, cashmere, candles. Raucous Jewelry features necklaces, bracelets, earring and more. They work with sterling silver, fine silver, precious metal clay, copper, steal, brass, leather, gemstones and old treasures found along the way. Sea Legs is a rustic mariner home d�cor shop inspired by their own vacations to the sea and beautiful lakes around Minnesota. Their products are exclusively painted by hand, giving each piece its own distinct character and charm and something that will be uniquely your own. Simple-Trends offers a great variety of handmade items. The recycled wool sweater mittens are made with top-quality wool, cashmere and angora sweaters. They are lined with fleece for your hands to stay warm and soft all winter long. Simple-Trends’ headbands are just what you need for your lifestyle, whether it be for a run, fitness class or just a day out! They also make handmade purses, a new fall addition. Skyline Specs engraves major city skylines into premium wooden sunglasses. 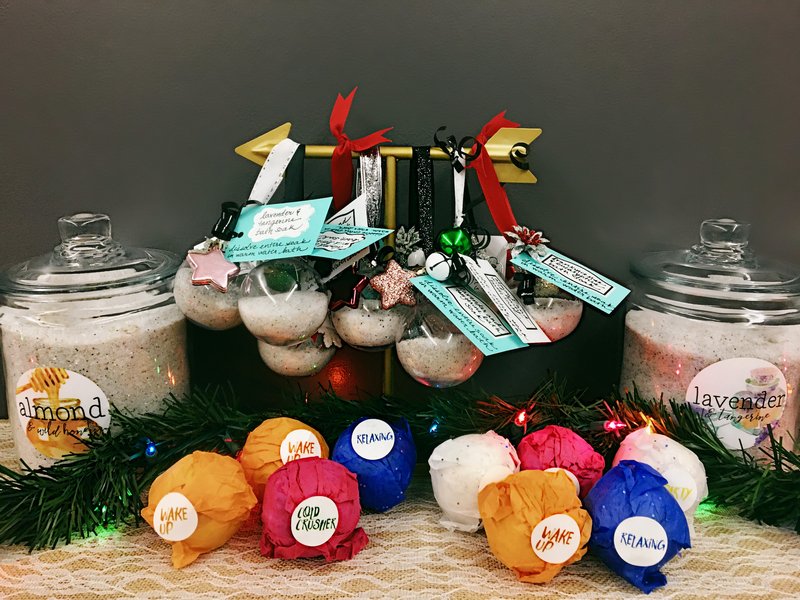 They started in an introductory entrepreneurship course at the University of St. Thomas and has since developed into a growing business. Come and explore The Smiling Olive which offers unique, premium, extra virgin olive oils and specialty, balsamic vinegars. You’ll find the freshest, finest quality from all over the world at the very best price. Perfect for the holiday season, Stitches by Carin produces hats, bags, shawls, hair accessories, all with a touch of Sweden. Stitches by Carin is run by a single person, with all products produced by her as well. Browse and enjoy an incredible selection of maple syrup flavors from this group based out of Lonsdale, Minn. Three Rivers Farm syrup includes about a dozen different flavors including blueberry, bourbon maple, cinnamon, cranberry, habanero, vanilla and more. Bottles come in a variety of sizes and packs. A great gift or purchase meant for sweet and savory meals alike. Stop by and enjoy! Triple Crown is inspired by a deep appreciation for quality headwear and the display of personal style. Triple Crown creates hats for the fashionably conscious soul who has a relationship with headwear that goes beyond style and fashion.